On Thursday, May 24, the Great Books Foundation will co-present a free webinar, “Little Women for a New Generation,” with MASTERPIECE on PBS LearningMedia™ and WGBH Education. This interactive session on Louisa May Alcott’s classic novel is designed for teachers of sixth grade and higher, and will be held at 6:00 p.m. CDT / 7:00 p.m. EDT. Registration is limited, so sign up today! Even if your schedule won’t allow you to participate in the webinar, you can access a recording of it if you register ahead of time. To celebrate the 150th anniversary of Little Women, MASTERPIECE has created a new two-part film adaptation that will air on May 13 and May 20. The webinar will feature clips from the adaptation; questions and teaching tips from WGBH education specialist Cyrisse Jaffee; and a brief, interactive Shared Inquiry™ demonstration from GBF senior editor Nancy Carr. 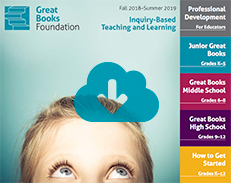 GBF has also created a free discussion guide for the novel with four sets of suggested questions and note-taking prompts, as well as guidelines for leading Shared Inquiry discussion. Interested in additional resources for discussing classic and contemporary works with middle school and high school students? Take a look at our other free discussion guides and our Great Books materials for grades 6-12.